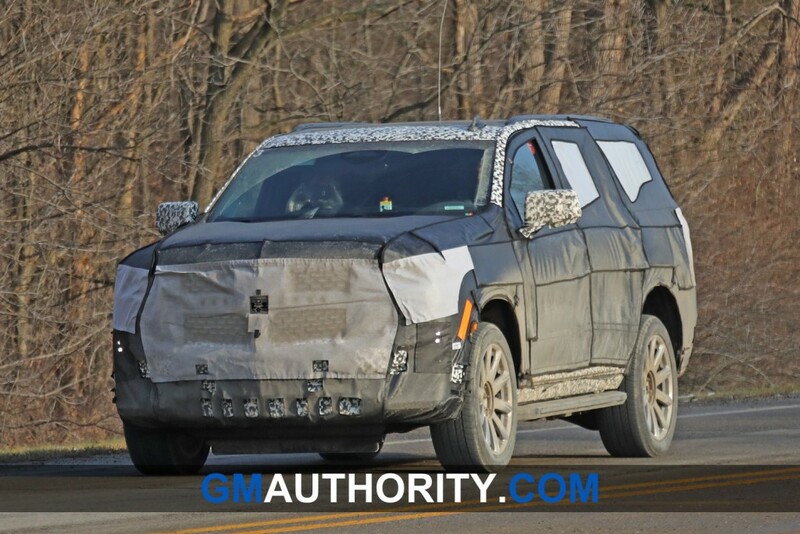 Chevrolet unveiled the 2020 Silverado HD lineup this past week, but we caught a glimpse of General Motors’ new full-size SUVs in the process. GM Authority snapped a photo at the reveal, which took place in Flint, Michigan, of a slide that showed all three new SUVs hiding under photoshopped tarps. The 2020 Chevy Tahoe, 2020 GMC Yukon, and 2020 Cadillac Escalade were all present. The automaker hasn’t officially begun to tease any of the three SUVs, but we do expect them to debut later this year, or in early 2020. The 2020 Escalade could be first on the docket. The fact GM included the SUVs in the presentation (nothing makes its way into a slideshow by accident) may show the automaker is closer to an official reveal, though. We expect all three SUVs to feature an independent rear suspension for the first time. 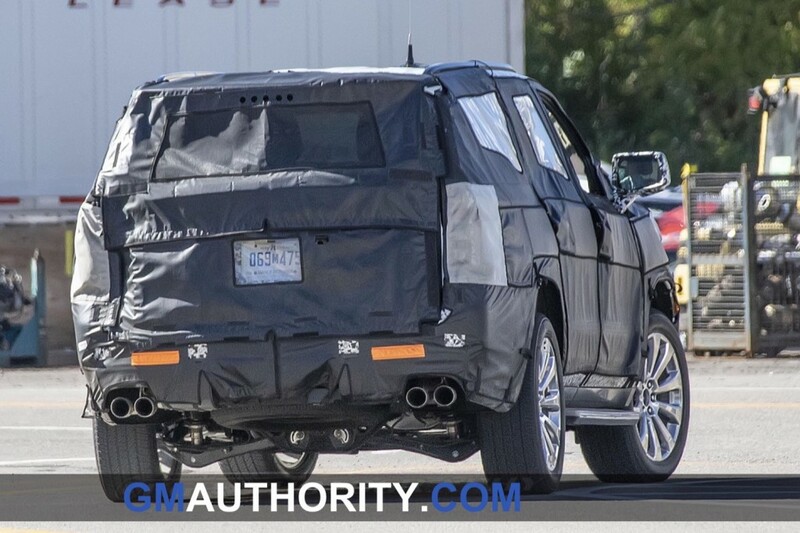 Spy photos showed the 2020 Chevy Tahoe sporting the setup, which should help create better on-road characteristics, yet retain towing and hauling prowess. The lack of a solid-axle design may upset the off-roading crowd, however, which have long preferred the setup for strength and articulation over rough terrain. Where the IRS will likely provide the most help is in the Escalade. Cadillac will likely try to hone the SUV’s driving dynamics, especially as the Lincoln Navigator continues to produce stellar sales results. It’s worth noting the Ford Expedition and Navigator have used an IRS since 2003. Look for even more differentiation from the 2020 Tahoe and Yukon to the Escalade, too. We expect a unique interior to the Escalade, along with the potential for Super Cruise and perhaps exclusive engines. Stay tuned to GM Authority as we bring you the latest on all three SUVs. An exciting chapter in the book of the Chevrolet Suburban, Tahoe, GMC Yukon/Yukon XL and Cadillac Escalade/ESV is happening soon. Very excited! They better not cheap out on any part of the new Escalade. Competition is fiercer and more competition coming. Not one inch of cheap plastic or cost savings. Mary Barra better have all the details covered. And stop making simple and boring, GM! Add lounge reclining seats in the back for God’s sake! Great auto companies do the details right and also push the envelope. GM can’t just meet the current standard in luxury SUVs; it must deliver something much better and special. I believe this is called a Taliban Tease. But in this case, more will come off, eventually. There should be much more room for cargo/passengers in the back row now. I will take a Suburban with the 6.2 V8 in base trim thanks. or how about 4.4L V8 turbo that has 50% more power and 60% more torque? If they are a 2020 YM shouldn’t they be revealed ASAP? Tahoe with a V6 please. Come on GM! Hurry up and pull the cloak of these new 2020 models already. Why are we always last to the party! Yes! I’m really leaning twds the Lincoln Aviator so GM you better pull out something nice for the Tahoe!!! I too don’t understand the tease. If certain individuals are in the market for a new SUV wouldn’t it wise to show what is coming so interested individuals can make a immediate decison to wait if they are interested in GM’s 2020 SUVs or make a choice for a Non-GM Vehicle which may not be playing the tease game like GM? They still have 2019 models to sell…..
they’ve got a LOT of 2019’s (and ’18’s) to sell, Wheelie. They could cover it in gold and I still wouldn’t buy if I have to keep dealing with my local GM dealerships. They are nowhere near the caliber of MB/BMW/Lexus or even the Lincoln dealerships in my area (Houston). They’re junky, cluttered, and frankly driving a $60-100k vehicle in for maintenance is hilarious to see. Fix the dealership situation, especially for Cadillac. Sewell Cadillac along the I10 (Katy freeway) is not junk, littered or anything else you mentioned! I’ve been there many times for services, and have been impressed by their service levels, facilities and professionalism. You’re a liar or an idiot!! Or maybe Jo Smith needs to move to a better place. That is deafly is holding me back to from buying another GM! The lack of local dealership ability to handle the more expensive automobiles specially here in Memphis. Good news. I hope they don’t all resemble each other as much as they do now. Surprised they haven’t mentioned the Suburban/Yukon XL/Escalade ESV. I read the article but GM must have something down the pipeline for the LWBs. what’s the expected reveal dates then. They should’ve teased the Escalade separately & at a later date. I just bought a 2018 Escalade at the end of August. As soon as the 2020 is available for pre order, I’m getting one with all the bells and whistles! You’re right, Jo. I’ve been to area dealerships, and Sewell, for example, IS junky compared to other non-GM area dealerships. That IRS betterdo at least as much good for the mega SUV platform as IFS did for the full size and HD truck platform in 1988. Fixing what isn’t broke can be done, and can improve the product, but it better be done right. Escalade to debut at New York on April 17? Dealers by August? Here’s to hoping… 75 days to go! Four months after reveal would be nice. The usual GM time from show to showroon is between 12 to 18 months. I wonder if its been engineered for RHD? End of March is when Arlington factory has plan for model changeover. Down time is only 1-2 weeks, then I would think a slow trial startup later in April. We may see these 2020 models before the NYC auto show, which starts April 19. As somone who has put 100K miles on a 2015 Tahoe, and another 75K on a 2017 Tahoe, I sure hope these are released. I am due up for a new full size SUV in September. Any particular reason you trade them in around 100k? My experience with these things is that they’re capable of going much, much further than that – you might face some electronics issues along the way here and there (which vehicles don’t eventually? ), but the drivetrain, body, and interior hold up pretty well. All of the online fleet order guides show production of the 2020 Tahoe, Suburban, Yukon, and Escalade will start at the end of this June, so they’re not far away. My guess is we’ll see them spread out over the New York and Chicago Auto shows.